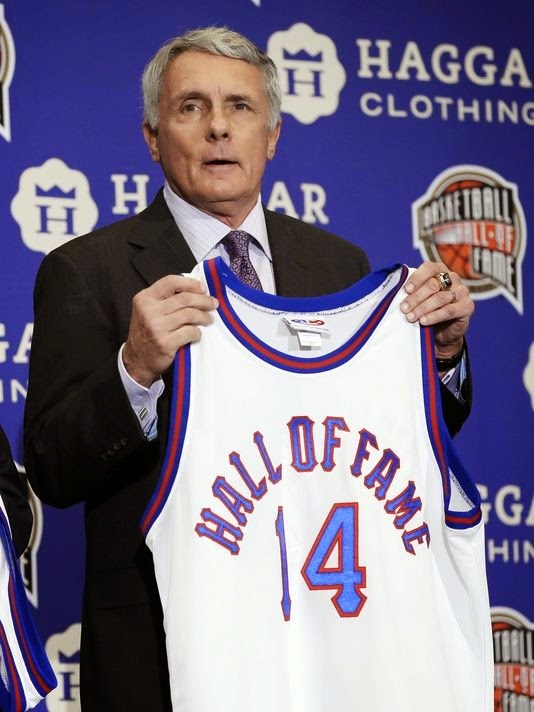 Now at 69, the two-time ACC Coach of the Year’s 2014 Naismith Hall of Fame class includes Alonzo Mourning, Mitch Richmond, the Immaculata University women’s basketball team, Nolan Richardson, Bob Leonard, Nat Clifton, Sarunas Marciulionis, Guy Rodgers and David Stern. The group will be enshrined on August 8, in Springfield, Mass. In 1968, Williams got his first coaching job, Woodrow Wilson High School junior varsity basketball team in Camden, NJ. According to Williams, the job kept him out of the draft at the time when President Lyndon Johnson was escalating troops into Vietnam. He went on to lead an undefeated variety squad a year later after the previous coach resigned. “That gave me some confidence that I could coach,” Williams said. Eventually after assistant stints at Lafayette College and former Big East university Boston College, Williams found his way to American University. Originally when he was hired in 1978, there was no gym on campus. During his time at American, he coached three 1,000-point scorers including American's all-time leading scorer, Russell Bowers and developed American's all-time assists leader, Gordon Austin. While at Lafayette, Williams had to fulfill duties of being the head men’s soccer coach in order to be the official assistant coach on the men’s basketball squad, a lesson that Williams has treasured in terms of doing the little things to reach the ultimate goal. And so he did. After head coaching jobs with Boston College and Ohio State, Williams eventually returned to his alma mater, Maryland, to become only the seventh head coach in Terrapin history. However, it was not met with jubilation as the NCAA had imposed the basketball program harsh sanctions banning the team from postseason play in 1991 and 1992, and loss of several scholarships over two years. According to Williams, his good friend and late commissioner of the Big East Conference, Dave Gavitt almost convinced him to join his staff when Gavitt took over as CEO of the Boston Celtics in 1990 which could have given Williams a chance to leave the College Park train wreck and coach in the NBA. After recruiting locally in the District-Maryland area success was on the horizon and five years later, a Maryland squad led by Naismith Award winner, Joe Smith earned the Terrapins its first Sweet 16 appearance since 1985, and that was just the tip of the iceberg. After I coached at American U, I was fortunate to coach against the greats of the game that I respect,” Williams said. “It’s really a lot of fun. He spent four years at American which included two NIT berths in 1981 and 1982 and accrued 461 wins at Maryland to go along with 14 NCAA Tournament appearances, two Final Fours and a covenant National Championship in 2002. Because of the humbling memories a hall of fame enshrinement brings, Williams reflected on Tom Davis, former American assistant and Boston College head coach who he idolized as a mentor for his coaching career. Even further, according to Williams, the reason he wanted to be a coach was his high school coach in New Jersey, John Smith, who was like a father-figure to him. All this full circling when he retired from coaching in 2011. “You do miss parts [of coaching],” Williams said. “But you have to remember everything, not just the good times. That helps you get through it.